First the trail passes through oak, Sugar Pine, Jeffrey Pine and a few cedars. Higher up the trail, Lodge Pole Pine begins to predominate, and finally, near the top, the rare and picturesque Limber Pines are found. 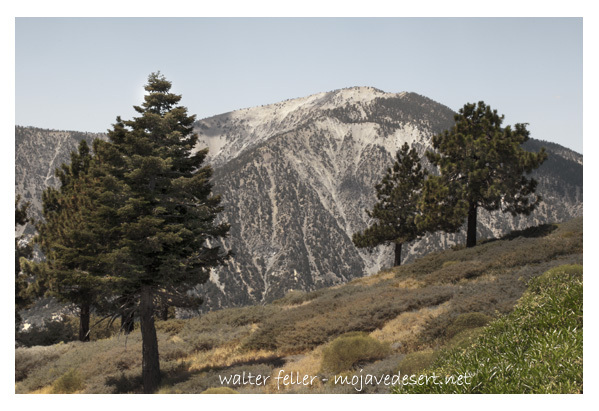 As much as 2,000 years old, these Limber Pines were discovered in 1962 by Angeles National Forest Supervisor Sim Jarvi. Near the top a small grove of these unusual trees is located about one-fourth mile off the main trail on a marked side trail. There are also photogenic specimens of this tree along the main trail almost at the nearly bare summit. From the top, the bottom of the East Fork of San Gabriel Canyon may be seen more than a mile vertical distance below you. Across this rugged chasm looms the massive peak of Mt. San Antonio (Old Baldy), the highest peak in the San Gabriels. On a clear day, the San Gabriel Valley and other distant mountains are visible, as well as a great expanse of the desert to the north. Hanging around the peak of Mt. Baden-Powell. Elevation 9,399 ft.
Rare Limber Pines, ancient and enchanted trees that can only exist above 9,000 ft.
Small spring emerges from under a rock. Take a peek in and see where it's coming from. Hike to the the top of Mt Baden-Powell. Four miles and over a half mile up along the Pacific Crest Trail from Vincent Gap. Tom Vincent's place for 56 years.